Fine arts in the form of dance, music, painting, sculpture or architecture have a great power of captivating the attention of human beings of diversified interests and tastes. What the thousand words cannot communicate, dance hand gestures or few lines and colours create a great sense of visual impact of everlasting nature. Many philosophical or religious paradoxes that are found extremely difficult to touch the minds of people are conveyed with ease through the medium of art. Every culture in its formative stages have applied the visual and performing art forms to communicate the complex ways of religion and thereby brought the followers into the fold of collective consciousness. The art would take the people to a state of well being which could motivate them furthering the cause of human progress. Indian art in the form of dance, music, theatre, poetry, painting, sculpture, architecture have evolved through the centuries in complementing each other. It would be unfair to reason out the evolution of these arts in a chronological manner because it is not possible to say which art came first and which followed the other. In fact compartmentalisation of art forms as seen in the study of western art has not been the approach for studying Indian art. It is sure that certain factors are common to all art forms like rasasutra, the aesthetic delight, thematic application and following of textual sources etc. pointed out as mimesis of the affairs of all three worlds namely earth, heaven and the netherworld1. This instance over and again refers to one point that in India dance cannot be isolated from other arts. The exploration of this nature of Indian arts is successfully implied in the integral formation of Indian temple architecture. When viewed in totality temples in India can rightly be considered the cradle of Indian art forms and they stand testimony to our great cultural heritage. When a comparison made with the Indian temple to the western religious edifices, the essence of Indian artistic spirit springs up. From Structural point of view, the Greek temple, the Romanesque church and the Gothic cathedral, all served their purposes equally well. But the differences in the ratio between the base And height create different aesthetic appeals. The Greek temple sits squarely on the earth and reflects the clear realism of Greek mind. The height increases in the Romanesque structure, which therefore reflects the desire to impress with a sense of power. The Gothic cathedral soars up like a prayer. Manasara, the manual of Indian temple architecture speaks about the aesthetic principle of the integral architectural form that was cherished on Indian soil. The aesthetic values grasped through integrating the other arts along with architectural principles. When the height is equal to breadth, the category is santika or restful, when the height is one and one-fourth of the breadth of the base it is paushtika or strong: when it is one and half times, it is jayada or triumphantly affirmative, when it is one and three-fourth it is dhanadaka or affluent rich. The last category is where the height is twice or more of the breadth is called adbhuta or marvellous or sublime2. The key principle of eternal creativity is the adbhutarasa. The responsive effect of it is the aesthetic delight that the creator and the viewer become one in the shared experience. Unless ‘diversity in unity’ is the directive principle of the creative process where interrelationship of arts is not realised the Indian artistic expression falls short to experience the sublimate for which the ethos of temple architecture stood for millenniums. enshrouded with sculptures more beautiful and meaningful. Though iconographic texts were the basis for Indian architecture and sculpture, consideration of beauty was the overriding factor. The artists were given the maximum freedom to render aesthetic creations encouraged the artists to create sculptures in stone and in metal to portray the elements of beauty to evoke rasa in the onlookers. But for the enchanting, beautiful and varied poses of dance, Indian sculptures and their placement in the architectural space would have become monotonous with the repetition of the same bhangas. Thus the artist very intelligently made use of dance in his sculptural art and thereby enriched not only his medium of expression but also the art of dance. This made Indian architecture and sculpture inseparable from dance. Indian temple architecture houses hundreds of sculptures exhibiting the musical instruments and the techniques of dance as prevalent in the respective period. 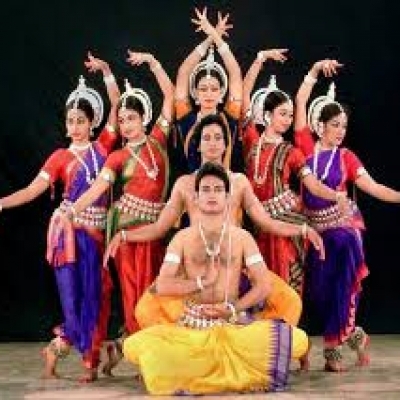 Any attempt at reconstructing a history of the classical dance in India, therefore would rely not only on dance texts and commentaries down from Bharata’s Natyasastra but of necessity delve deep into what was preserved in the practicing tradition of preceptors as well as dancers. Continuous cross references to sculptural material would be absolutely necessary for understanding Indian dance3. It is clear that the architects and sculptors from ancient times had a thorough knowledge of Indian classical dance forms and it would be almost impossible to find defects in the dance poses from the technical point of view. In other words, the sculptors and painters had a good knowledge of Natyasastra, Sangita Ratnakara and other texts and they based their artistic creations on these texts, which speak, of technically superb presentation. However it has to be emphasised that all these dancing sculptures are not aesthetically similar in qualitative expression because in this respect they depend upon the capacity of the sculptor or the painter to express himself in his chosen medium4. the Virupaksha temple at Pattadakal (Early Chalukyan capital of 8th century A.D., in the northern part of Karnataka), there is an inscription consisting of two Sanskrit verses in praise of Achalan Bharata5. He had studied Bharata’s Natyasastra in detail and knew everything about the technique of drama and acting. He was both a dancer and an actor (Nartaka and Natya). This inscription throws light on the popularity of Bharata’s Natyasastra in the southern region. It appears that he was also the author of a work on dramatic compositions and had his own style of dancing. The Pattadakal male dance figures were sculpted with the inspiration of Achalan’s performance in the temple. Painting is a two dimensional art, expressive because of the colours. In India early representation of paintings is well documented in the pre-historic sites like Bhimbedka and surrounding areas. The graffiti on the pottery of Indus valley is the next developed phase of understanding the sketching of human forms in action. Human figures in continuous movements are drawn on the walls of the pre-historic caves indicating dance figures in line drawings. Natyasastra finally emerged as an avahitta sthanka a standing posture for nayikas, divine beings like Parvati, Lakshmi and other Devanganas. Followed by Ajanta two dance sequences in Bagh cave paintings of 5th Century A.D. represent a Hallisaka composition one of the popular form of dances of those centuries often mentioned by Bharata in his Natyasastra. In both the groups a set of six female dancers have encircled a male dancer. Bharata discusses in detail about four vrttis the mood or atmosphere which is characterized by different kinds of action, viz, Bharati, sattvati, arabhati and kaisiki. These vrttis are derived from four Vedas, Bharati from Rig-Veda, Arabhati from Atharvaveda, Sattvati from Yajurveda and kaisiki from Samaveda. Vasudeva Sharan Agraval feels that these four styles were connected to four regions namely Bharati belongs to the region of Bharata, Kurukshetra, Sattvati belongs to the region of yadavas of Sourashtra, kaisiki to Krathakasika or Vidarbha and arabhati to the country Arabhatas or the region of south Baluchisthan, inhabited by the people called arabhatas. This was the border of Bharatavarsha, Abhinavagupta also follows the view of Bharata and describes the various dance forms existed even in 9th century A.D. as dombika, Bhana, Prasthana, Bhanika, Prerana, Ramakrida, Hallisaka and Rasaka. They were considered as nrttatmaka prabandhas which means dance compositions. The impetus given for performing and visual arts throughout India during Gupta age was so strong and so integrated that the principles it established persisted for a long time and contributed for the flowering of later styles. The cognate styles are mainly drawn from Gupta idioms in dance and paintings with little changes due to regional influences. The paintings of court dancers and musicians adorn the interior wall spaces of Badami Vaishnava and Sittanavasal caves, Brihadeswara, (Tanjore), Virupaksha and Virabhadara temples (Hampi and Lepakshi respectively). The miniature schools of paintings epitomised dance and music in the form of nayikabhava, Gitagovind, rasaleela and ragamala painting series, eternally depicting the glimpses of imagery which has finally harmonised all art forms including literature. Govinda occupies a significant place and the abhinaya is rendered as depicted in the paintings. Keshavadas wrote Rasikapriya in A.D 1591 on the theme of ashtanayikas, the eight types of heroines as discussed in Natyasastra. The artists of pahadi schools painted this theme so vividly that they are known as nayika paintings and they have direct parallels to the ashtanayika abhinaya in dance. The nayika paintings from Kangra bear the inscribed text from Rasikapriya. Human body is best exposed to express movements and variegated stances in sculpture by applying dance techniques. The dual arts of dance and sculpture were put to best use and implied in an awe inspiring way by the architects of temples up to the 13th century in north and 16th century in south India. The institution of temple dancing from the earliest times perhaps inspired the sculptors to create dancing sculptures. They have crystallized the existed forms of dancing through the enchanting images. The temple sculptures all over India exhibit the Marga tradition (the early style) adhering to Natyasastra system, which was in vogue up to 10th century A.D.
discussed in Bharata’s natyasastra. Here three dancers hold each other dancing with cross-legged position. The agamas chant in praise of dancing Shiva, the Nataraja. The sculptors captivated Shiva, in his elemental state, as the creator of eternal cosmic energy who was beyond the temporal boundaries of time and space. They visualised him dancing continuously with perfect balance and ever transcendent in His creative content. This divine form of dancing Shiva filled the power of ideation of sculptors, dancers and the devotees alike. He is the source of cosmic harmony and rhythm animated in three aspects of dance. The destructive – the tamasa aspect of Bhairava, The Yogic – The divine dance of twilight performing on the Mount Meru and lastly the gift-giving – here Shiva dances in the form of Nataraja in the hearts of His bhaktas, by killing their ignorance and lifting them to the path of Divyajnana, the enlightenment. This is the gift giving aspect to mankind. The origin and development of classical dance is strongly associated with the last two aspects and portrayed in the Shiva Pradosha Stotra as dancing in the golden hall of a temple. The impact of this concept found in the expression of the architects in erecting the most magnificent natyamantapas of high artistic merit in the vast premises of the temple signifying as the abode of Shiva’s dance. All the divine beings take active part in the blissful moment of the Lord’s dance picturing vividly as Sarasvati plays on Veena, Indra on flute, Brahma on cymbals, Vishnu plays on mrdangam while Lakshmi singing. The gods, demi-gods, apsaras, yakshas, gandharvas stand around to witness the celestial dance and hear the music of the divine choir of the twilight6. The faithful rendition of this divine theme opened all the gates of the imagination of the sthapathis and gushed out in the form of expressive panels depicting Natyagama both in the rock-cut architecture and also in the grand edifices of Chalukya, Pallava, Rashtrakoota, Chola, Hoysala, Chandella, Sena, Kakatiya and Vijayanagar styles. The dancing hall of Veerabhadra Temple Lepakshi has the individual pillars depicting the life-size figures of the divinities supporting with musical instruments as mentioned in Shivapradosha stotra for the dance of Shiva. the mid sixth century A.D. The shaiva cave with its open hall offers a panoramic view, with the rays of the twilight turn the impregnate image of Shiva into a golden icon, dancing to the drum beats of a sole drummer vibrates through the stillness of the hilly range. The eighteen armed Shiva dancing on a lotus platform move all his hands at the right side applying the hand gestures as specified in Bharata’s Natyashatra. Another set of left hands hold the veena and other shaivagama attributes. The Aihole Nataraja is in parivrtta karana and the hand gesture are in a teaching attitude and the disciples of this great Guru are none other than the Saptamatrukas7. Between sixth to the early eleventh century, the sculptors caught with the imagination of dancing Shiva, had portrayed in all possible manner through out the country. The nadanta pose of Chola Nataraja is the derivation and experimentation on the concept of Chalukya Nataraja. Rajaraja Chola immortalised the form of Nataraja, as he fondly called the great Lord as ‘Adavallavan’, one who knows to dance. The concept of the dance of the twilight was so mystic and sensational living the imprint on the minds of the devout, that they erected hundreds and thousands pillared halls for the purpose of dancing. The round shaped or squire platforms proved as the imaginative space where the celestials danced for the joy of the bhaktas and energise them with their blessings. The mythological doctrines promoted the idea of apsaras who were the representation of a symbolic conception of ecstasy, dancing to please gods gave a parable picture of the desire to impart to countless souls on earth that indescribable bliss of being with God. The far reaching effect of Bhakti movement on the lives of common people, and considering dance as a means of attaining salvation had pervaded the agamikas to include dance as one of the prime services of sixteen kinds of offerings to god in a ritualistic manner as the shodashopachara conducted as the evening worship. In relaxed mysterious evening atmosphere the enduring mental pictures of divine dance imagery caught the impulses of artists, connoisseurs and devotees alike. The common people found their inspiration in such tangible experiences. the pleasure of devas and used as a means to divert the attention of the rishis from austere practices, transformed into a divine service in the medieval temple traditions. As a result the temples vied with each other in having the best dancers and musicians in their services. Thus the temple dancing was institutionalised and the dancing girls were patronised by the kings and mahajanas and were often respectfully mentioned in many inscriptions of great temples built in the medieval age. A very early old Kannada inscription from Pattadakal of Early Chalukyan times (8th century A.D), speaks as “Hail! The pillars of Challabbe, the harlot of the temple of Sri Vijayeshwara”, she was the famous Devadasi who got the pillars made as the votive offerings to God. The great builder Rajaraja Chola (1010 A.D) commissioned a detail inscription on the walls of Tanjore Brihadishvara temple. The inscription records as, dance and music was performed every evening when the community assembled for the worship of the deity amidst the chanting of hymns. Many thousands of acres around the temple were set aside for the cultivation of the rice, other food articles, and flowers used in the daily rituals. Cooks, gardeners, flower gatherers, garland makers, musicians, drummers, dancers, jewellers, dance masters wood carvers, sculptors, painters, poets, choir groups, accountants, watchmen and numerous servants and officials were employed on regular basis and so the inscription tell us, given grants of land. Rajaraja specially constructed two long streets just to house the four hundred dancing girls attached to the temple services. They were drawn from different regions and the best dancing girls were from Karunadu (Karnataka). involved in offering their art to the divine service. In times of Vijayanagar entire South India and parts Orissa came under one rule and by this time the bhakti movement lost its essence and the temples were the place of grandeur and celebration of events the dancing girls were more exhibitionistic in their presentation. The temples of Khajuraho, Bhuvaneshvar and Puri echoed with the lyrics of poet Jayadeva (whose wife Padmavati was a Devadasi) the devadasi system in these temples were a living tradition till recently. Efforts are being made by the priestly class of Jagannath temple to revive the nartanaseva in reality as against the practice of today chanting as nartanaseva samarpayami as part of the daily shodashopachara ritual. In the later days due to economic constrains, tantric practices, the damsels in the temple service were victimised to become public women and they were equated with the prostitution. The term devadasi which was used in divine sense was replaced by the term Bhogastree. The British government in India in order to uplift the women, their emancipation in education and to protect them from social evils abolished the Devadasi system. The present Bharatanatyam style finds its substance from the Dasiattam of colonial times. If at all we regard Indian dance as the spectacular contribution to human endeavour we should recall today with great reverence the entire class of Devadasis who were the repository of delivering the tradition in most difficult situations from Vedic to colonial times. Let us pay homage to all those souls for nurturing the roots of our flowering tradition on this fiftieth year of our independence. where as painting and sculpture are permanent but do not involve the rasikas in the process of creation. The rasikas derive their aesthetic experience on the finished paintings and sculptures. The profundity of the creative dynamism of dance, far-reaching based on innovations from time to time caught the ever-searching minds of sculptors and appealed them. They began to use these fleeting movements and captivating poses in all possible ways allowing them to transform their rigid forms into the forms of flexibility, dynamism and improvisation which broken the monotony on the architectural space. Thus dance sculptures are the embodiment of form, rhythm, unity, synthesis of structure and harmonized in the architectural space. 1. Dr. K.Krishnamurthy, Bharata’s theory of Rasa as applicable to all fine Arts – Historiography of Indian Arts: Insights Ed. R.Satyanarayana. 2. Krishna Chaitanya, A Profile of Indian Culture P.120. 3. Vatsyayan Kapila, Classical Indian Dance in Literature and the Arts, P.200. 4. Nandagopal Choodamani, Dance and Music in Temple Architecture, P.1.